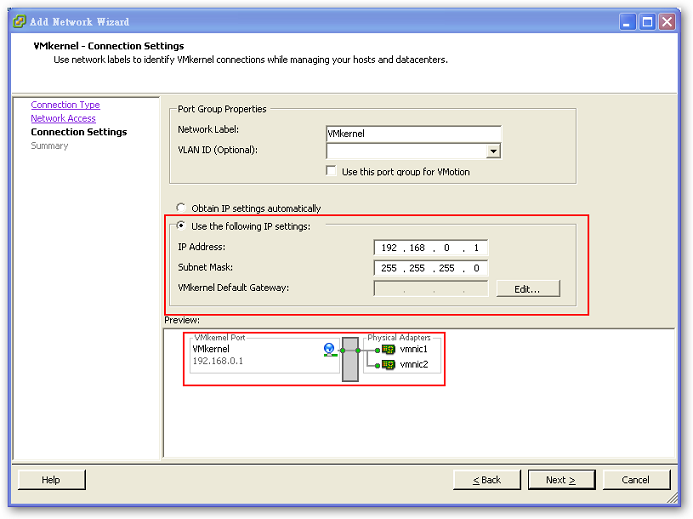 一開始的時候還找不到 Networking 的設定模式.不過仔細找在 Host / Configuration / Hardware(Networking) 可以看到目前 Guest 的網路設定狀態! 系統使用 bridge 的方式來設定 networking,也就是實體和虛擬 VM Guest 的網卡裝置的會像是串接在一個 Hub 或是 Switch 上,只要是同區段的 IP 都可以互通.在這邊還可以同時將多個實體網路卡裝置 bonding 在一起.也就是將兩張網路卡的頻寬合併在一起. 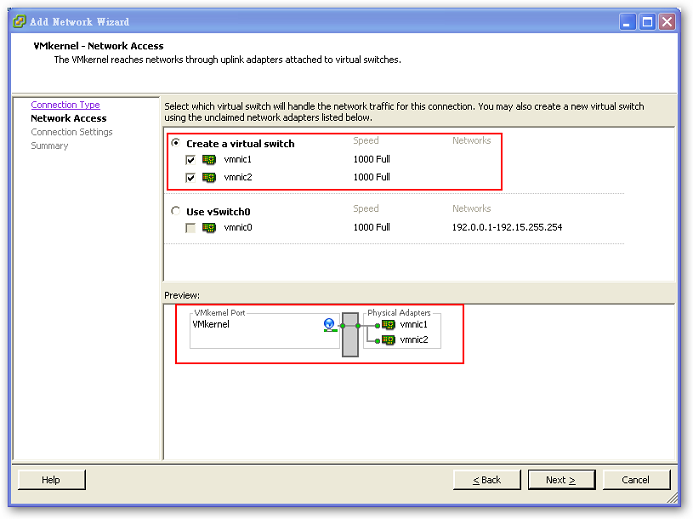 指出目前有哪一些的 VM Guest 的網路卡裝置是連接再這一個 Virtual switch 上.
VM Client 就是透過這裡所設定的 IP 進行遠端管理.據說還可以透過 iSCSI,Vmotion,NFS 這種大流量的裝置做存取,不過還沒有實際使用過. 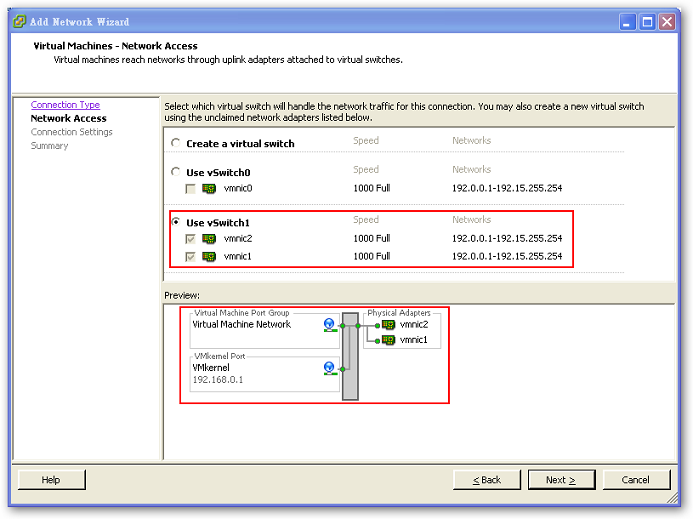 現在來看看如何新增 Networking 裝置,目前我的 Guest 有 RHEL5 / RHEL4 / SLES10_SP2 / Fedora10 網路設定幾乎是透過同一個 physical Adapter 出去,假如系統有多個 physical Adapters 我們就可以在這裡來設定另一個 Virtual Switch.來做分流的動作.目前我機器這裡有3個 physical Adapters ,除了原來的第一個一般儲存用途外,還有兩個我打算都把他當成 iSCSI 的連接.方式也很簡單在 Host / Configuration / Hardware(Networking) 有 Add Networking 來新增 Virtual Switch. 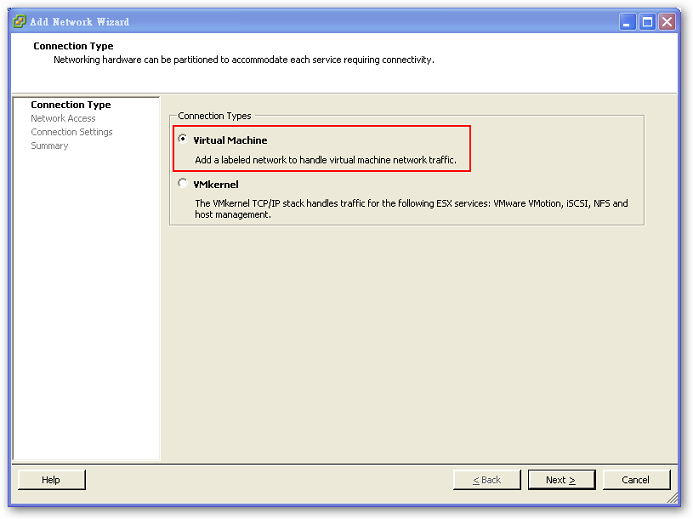 VM Machine 就是一般 Guest 要透過指定的虛擬網路裝置連接到實際的網路卡的模式.此時設定的 VM Guest 的網路卡裝置是連接在這一個虛擬的 Virtual switch 上.
VM Client 就是透過這裡所設定的 IP 進行遠端管理.還可以透過 iSCSI,Vmotion,NFS 這種大流量的裝置做存取. 首先新增 VMKernel 模式的 Connection Types. 可以看到尚未被指派的實際的網路卡 (vmnic1 / vmnic2) 一次可以選擇多個做 Bonding. 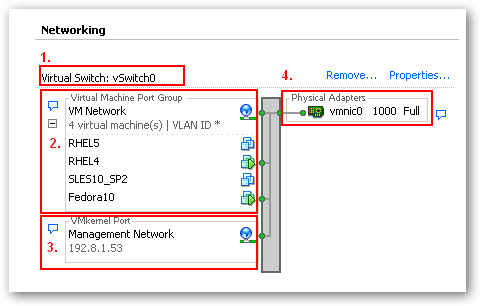 至於 vmnic0 已經使用在 vSwitch 裡面了.你可以回頭看第一張圖預設的 Virtual Switch vmnic0 對應到 vSwitvh. 設定一個 IP 可以作為遠端管理介面.按下 Finish 就結束了新增 VMKernel 的工作. 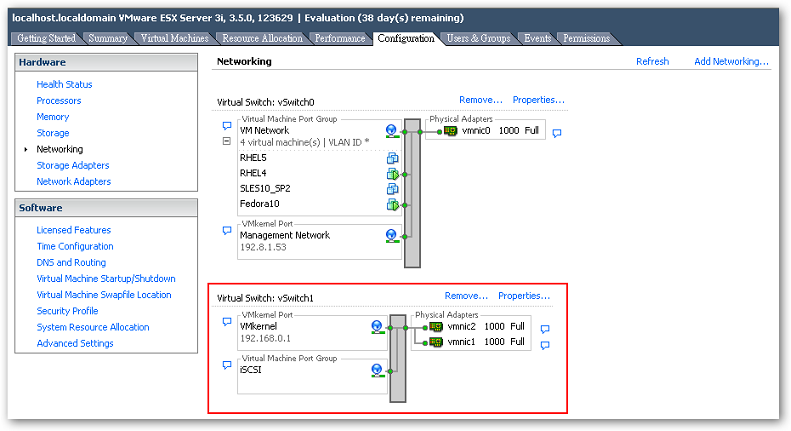 基本上就大致上已經建立好一個虛擬的 Virtual Switch 不過還要再指定一個 Connection Types / VM Machine 讓一般 Guest 可以透過指定的虛擬網路裝置連接到實際的網路卡. 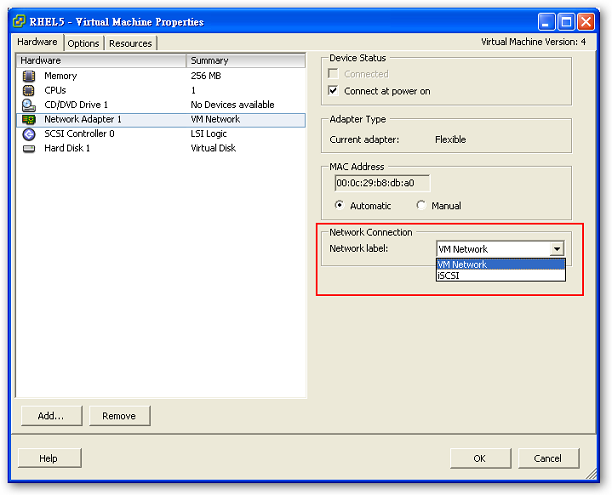 剛剛新增了 VMKernel 所以你會看到新增好的 Virtual Switch (vSwitch1). 指定一個 Network Label, Guest 是依據這個名稱來指定虛擬網卡. 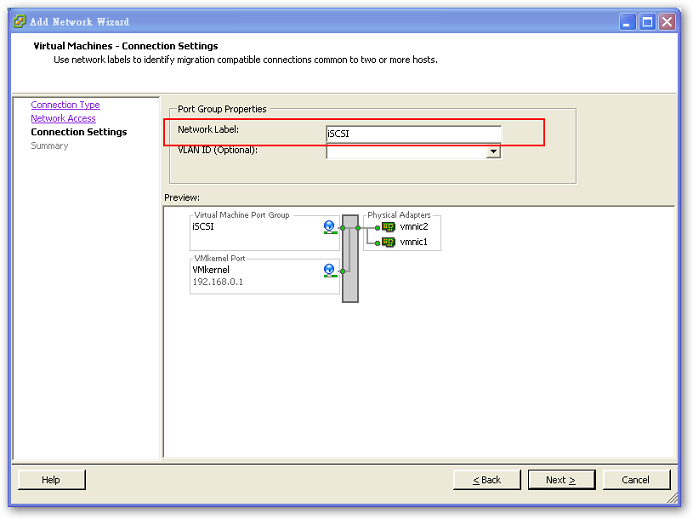 回到 Host / Configuration / Hardware(Networking) 就可以看到已經完成新增 Connection Types / Virtual Machine的工作了. 現在在 Guest OS 新增一個 Network 裝置看看.多了剛剛新增好的 iSCSI 裝置.